AT undercarriage parts are manufactured specifically for light applications usage giving our partners competitive alternatives when come to undercarriage parts. AT has always been one of the most competitive in the industry earning a good reputation in Quarry and Construction industries. We cover and stock the widest range of undercarriage parts applicable for excavators under 30 tons and bulldozers under 40 tons. 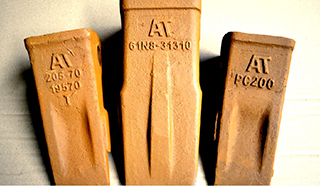 AT Ground Engaging Tools is one of the widest in range in the GET market. We cover a wide assortment of bucket teeth, associated adapters, different blade types, rippers, shanks, bucket types and associated peripherals interchangeable with most original equipment makes. AT believes in keeping up to the range available in the market. There is an ongoing process by our technical department to study and design all available and new up and coming range available in the market so as to complement our already wide range of undercarriage and GET products. We are constantly improving our production processes and making use of any material advantages so as to keep our products competitive in the market. Our manufacturing and quality processes are geared for mass production and are experienced in producing huge quantities ensuring economies of scale in order for our products keep their competitive edge. AT quality management processes are trained to monitor and adhere to quality consistency during bulk production of AT undercarriage and GET products. We ensure quality to be consistent for 1 piece or 100,000 pieces. Warranties against manufacturing defects are given when purchasing AT products. AT undercarriage parts are produced by undergoing all required processes of forging, machining, heat-treatments and assembling ensuring its quality consistency during operation. AT produced track links between 39L to 53L, standard/high link with standard/??? Bushings both standard and lubricated types. AT rollers come with either single or double flanges applicable for machines with operational weight between 5 tons to 40 tons. AT uses CNC precision-tooling capabilities to machine parts for its idlers. 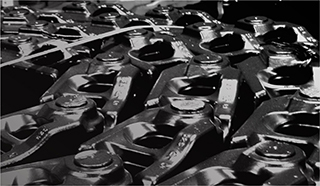 AT sprockets are casted with pitch between 90mm to 228mm. All AT track shoes are heat-treated to increase its working lifespan that come with width 300mm to 1000mm. AT undercarriage parts are applicable to excavators below 30 tons and bulldozer below 40 tons interchangeable to most OEM specifications. AT tips and adapters provides a wide variety of tips and adapters which are available in different design to suit your application needs. AT tips and adapters are specially designed and manufactured to meet your market’s expectations in quality and costs. AT buckets are designed and produced according to specifications based on your digging requirements. AT buckets are suited to withstand high abrasive wear while working on different types of materials. AT bucket accessories and wear parts are available to give maximum protection to your buckets. AT Ripper, Shanks and their protectors are produced using a high resistant material Cr-Mo alloy steel to withstand harsh working conditions without jeopardizing our competitive pricings. AT end bits & cutting edges are made from cast steel which will provide high impact and wear resistant. All bits and edges are specially heat-treated to increase its durability.